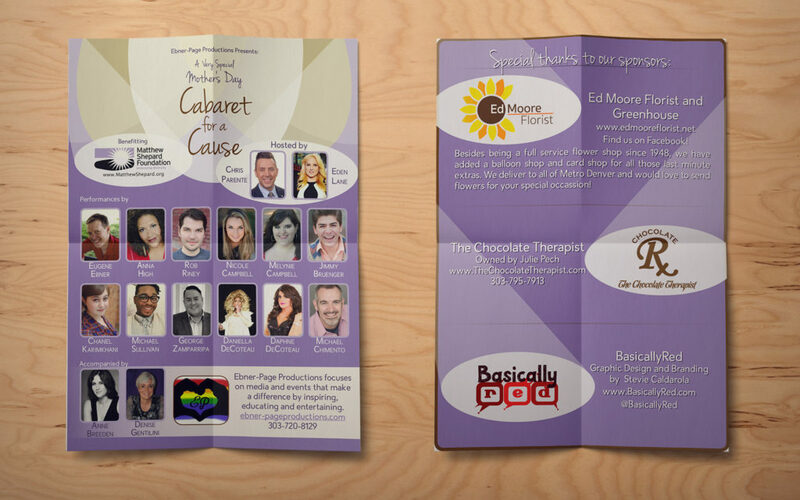 Cabaret-style fundraiser for a good cause celebrates mothers. Objective: Created in InDesign and Illustrator, this poster design was super fun to create. Knowing that the cabaret was being held on Mother’s Day and that the hosts of the event wanted to celebrate Matthew Shepard’s mom for all her hard work and dedication to the cause, I decided to combine the spotlight imagery to create some implied symbolism. The five spotlights across the top of the poster combine to create a flower. I also received feedback that the combined spotlights looked like an umbrella, representing a mother’s protection.